John Dunlop thought his invention for his son's tricycle was a first. Once he successfully tested his pneumatic tire he patented it in December 1888. Two years later his patent was declared invalid because Robert Thomson patented the idea more than 40 years earlier. But we know who the real winner is here. Know anyone riding around on Thomson tires? The Dunlop name in rubber and tires is long and complicated. It started in 1889 as the Dunlop Pneumatic Tyre Co. Ltd when it commercialized John Dunlop's invention. Over the years the Dunlop name encompassed numerous products and ventures and was bought, sold and merged with several times. Despite the perceived turbulence, Dunlop is a strong brand and is now sold in Europe and the United States by Goodyear. Dunlop has manufactured motorcycle tires in Buffalo, NY since 1920 and today it is the only major motorcycle tire manufactured in the US. Though John Dunlop lost his patent he was the first to actually make the pneumatic tire. His legacy for firsts continues to this day. Dunlop was first to introduce the use of Kevlar belts in motorcycle tires and they produced the first OEM radial street tire. Dirt bike riders can thank Dunlop for the first 20-inch front tire for off-road use and the company was first to manufacture premium tires for mini-bike riders. MotoSport's catalog of Dunlop motorcycle tires is extensive. What else would you expect from MotoSport and a company that's been manufacturing tires for more than 100 years! 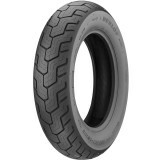 A favorite among cruiser enthusiasts, we feature 144 Dunlop motorcycle tires and tire combos for your Yamaha, Kawasaki, Honda, BMW, Harley-Davidson or whatever you enjoy touring around on. Unlike cars, motorcycle tires are not interchangeable therefore we make it easy for you to buy the correct front and rear tires for your bike. We also have combo packages allowing you to buy both. MotoSport makes it easy to find the size you need too. 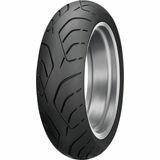 MotoSport features one of the largest selections of Dunlop motorcycle tires for cruiser bikes on the web. If you need help call our toll free line 866-677-7338 or chat with an expert. MotoSport offers fast, free shipping on orders Over $79.